Eurostar sell-off: Isn’t this interesting? It seems the Conservatives just can’t resist getting a last few bits of corruption under their belts before the end. If Labour gets into office, Ed Miliband should declare such contracts void on the basis that they may have been made corruptly. There should be barristers looking into shenanigans like these if only to see just how legal they are,or if there could be a case for insider trading of some sort. In any moral world it would be classed as corruption. Britain today where Murder,Theft,Paedophilia,Fraud, Perjury, Treason, any form of corruption is acceptable in the so called upper echelons of society, and where Honor Truth and Justice count for nothing. maybe they in power today in Westminster have only read books about how to rule that were written in/or about the 16th/17th century??? a list like that above is no different to a list that could be drawn up about the courts and parliament in those times. they dont realise we are living 4-5 centuries after those times. To add to the Labour leader’s humiliation, Newsnight host Jeremy Paxman bowed out on Wednesday night claiming polls show he ‘has about as much appeal as a flatulent dog in a lift’. The only time Ed takes his foot out of his mouth, is to give it a rest, and Balls is no better. Be honest would you trust him with the Economy, his track record is appalling,besides. he is an bully Boy with an overinflated ego. Ed Miliband? Don’t you mean David Cameron? In case you haven’t noticed, Miliband has trounced Cameron in all their recent clashes. We might be doomed if misguided ideas like yours are the norm. It’s the only thing the tories know corruption so nothing new here, let us see what else happens in the limited time period they have left, IDS is pushing his UC as much as he can albeit a disaster. Lets keep a close eye on the NHS shower of overpaid criminals. Agree whole heartedly with both above views. It would be even more interesting if the other dodgy sales, such as the Royal Mail, could also be frozen and investigated. Being a cynic I would have every sale made by the Tories investigated. There is no value in government owning assets that it doesn’t need to. It ties up resources that could be used for other objectives, like investing in new infrastructure or paying down debt. Eurostar is such an asset. It is managed on a commercial basis and will continue to be. Last October, we launched the sale of our holding, receiving over 20 expressions of interest from investors across the world. At the time, the shares were valued in our accounts at £325m. We announced yesterday that we signed an agreement with Canadian and UK investors to sell our shares for £585.1m – 80 per cent higher than the initial valuation. This was driven by the quality of the business and the highly effective competitive process we ran. We will also receive £172m for our preference share – delivering £757.1m in total. This strong result allows us to reduce debt and brings more private investment into our infrastructure. It is an excellent result for the taxpayer. EITHER WAY,,,THE TAXPAYER KEEPS ON PAYING CORPORATE ‘WELFARE'[. I believe the correct description of the tories, ‘borrowed’ from the business world, is ‘Asset Strippers’. I wonder if there will be anything left at all come May? This deal should most definitely be declared as corrupt, and therefore null and void. The Nasty Party is so steeped in corruption that it doesn’t know what honesty is. Contracts such as this one most definitely should be declared null and void. I personally would not even bother to put the word “possible” in front of “corruption” when explaining why. Why sell it now when it is making a profit? Because the Tories know they will not be in power much longer to cream off the profits for themselves. The Tories have sold practically all the National assets to their cronies and there must surely be some recourse to rectify their errors and also to seek punishment in the courts for such mal-administration. Like King Richard the First, this government would sell London if it could find a buyer. It probably already has, we just don’t know about it yet. it already has sold housing in London to overseas millionaires, council rentals to big foreign businesses to fund overseas pensions. I honestly think that the Tory Party is currently more corrupt and divisive than ever before. Make all contracts like this null and void in the first month of the election should Labour win. Also, change a lot of the laws that have been brought in so that the rich always get the money. And yes, you can change laws. Stop sanctions with immediate effect and look into the benefit system in favour of the people on benefits. First thing to do – have IDS, McVey, Lord Fraud and Cameron arrested for Crimes Against Humanity. There are enough witnesses for these crimes. Hurry the UN to make their investigation known to the world. I’m not sure about Ed Balls, I think we need someone else? Hermes investment is owned by the BT pension scheme. 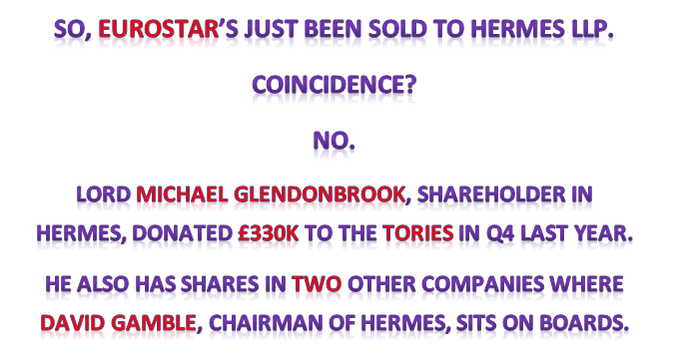 Lord Glendonbrook owns shares in Hermes. The handbag people. Completely agree that an investigation must happen. I also await the outcome of the investigation of Glasgow City Council, where ‘dodgy’ dealings are allegedly commonplace.